I don't usually post too much for discussion during development, but thought I could see what people think this time. Maybe I'm unsure on demand, maybe I realise already there should be some changes, maybe I just want to experiment with discussion..
First off, just to be clear - this project isn't really a main focus for me at the moment - I've bandied around ideas of Matrix Mixers for several years (there was the 4x4 in the modular line and I almost got going on a very big mixer collaboration project a few years back..). So, don't yet count on this actually ever reaching fruition - and anything will likely be some way off anyways. (did I kill the buzz enough already?!). As I said, partly I'm interested to see if people are interested! I've seen a few PASSIVE Matrix Mixers appearing of late. But for proper fidelity and control, I really think ACTIVE is the only way - just as with regular mixers. How big? Well, you'll almost always want more inputs than outputs (so some can be used as effects returns most likely). Does a 6 x 4 provide enough, but not too much? - improved signal level indication - 2 or more leds per input and maybe the same for each output. - maybe impedance balance the outputs. - scribble space (white rectangles) on the panel to note input/outputs. One other thought would be to treat the lower two rows differently - change one row to PAN and the other to LEVEL. Saying that, same could be done for the upper two rows too. It is a subtle but perhaps useful difference. Oh and I haven't yet tried any form of zener/diode level limiting - something I've used a bit of in recent designs & which could well be useful here - - definitely something for me to try in the next stage. The build size is twice the length of my current standalones (ie. 6 FracWidth) with internal DCDC power conversion. Decent, but not over-the-top-$$$ opamps inside. I don't think anything really exists along these lines at present? i would definitely be interested in an active matrix mixer. i had a passive one for a while and it didnt work for me. 6x4 would be sufficient. signal level leds would be a rad bonus. and having all this in bugbrand blue would be a major selling point. sounds very, very interesting to me! 6 x 4 means i can patch it as 4 x 2 with 2 channels of feedback (that can be routed through a pair of vcas, for example). that should be sufficient for my purposes, although i wouldn't if there were another pair of inputs. i would be really keen on mute switches, for each input-output pairing. and i am curious about how having one row of level pots and another row of pan pots would work - does it become a 6 x 2 mixer then? super-interested. i have a matrix, and would much rather deal with an active mixer. i'd love a way to link, for a 12x4 or just a bigger one. 6x4 seems like a sensible size for the matrix, the same as the Hordijk one I use. 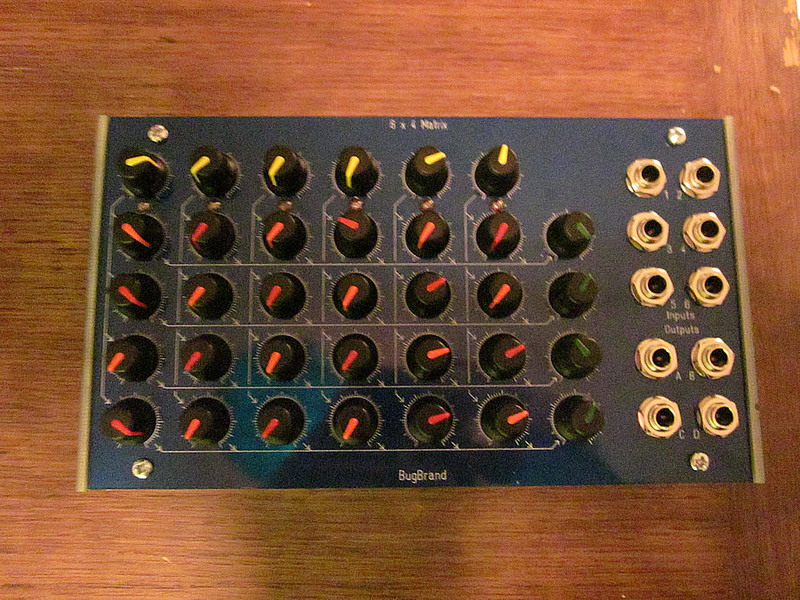 I considered a 6 by 4, but then asked myself how often I would want to actually mix 6 signals together. I ended up making a 4 x 4 and a 4 x 2. That gave me 8 inputs and 6 outputs and seemed more flexible (not to mention that it fit my panel space well). I think in stand-alone I would prefer to have two 4 x 4, rather than a 6 x 4. I do like the idea of master input and output level controls (your yellow and green knobs) for the columns and rows, although I think the master input level controls might be the more useful of the two, if I had to limit panel space. Choice of 6 ins / 4 outs well..
As I say (replying to Richard/Pugix) - I do think you tend to need more inputs due to effects returns. Linking -- yeah, dunno... I'm generally liking thinking in self-contained approaches at the moment. Mute Switches -- yes, maybe..
Mute switches and ouput blinknelights would make me happy. Anyway, interested to see where this ends up... I hope to be in for one. 6x4 is a good size. I'm a bit hesitant about making the lower 2 output tracks a stereo track by having Level+Pan instead of two levels. In theory you can do the same things, but you interact with it differently. Maybe it would be good, allowing it to be used as a normal mixer with two sends, ans you say, Tom. Maybe it complicates the more wild matrix-specific uses. You could add a bus connector for a flat cable on the PCB to allow for channel expansion. Shouldn't complicate the circuit too much (but I'm no expert). Regarding zener limiting - might be a nice feature, but a bit off target. I think high headroom is more important. This would be great! Yes to banana and 1/4", balanced outs, and some scope for inversion/feedback. Don't know if it's just the photo, but those nanas look extra colourful... What brand are those, and where did you buy 'em? Johnson/Emerson banana jacks from Mouser. Green part #530-1080904-1. Photoshop enhanced. hooray, tho i would also be just fine with the original design shown on p1 (esp if items such as click/thud-free operation of the switches adds signiciantly to product cost and development time - knowing tho, i think i can solidly hope for clever solutions). Funny - I was just thinking on the bus back to Bristol today that I'd not progressed at all with the matrix ideas and wondered if anyone would notice sometime.. !! I'm still in love with the Matrix Mixer! :tu: i actually woke up thinking about the :bugbrand: matrix this morning (i believe it came in at the end of a dream concerning ciat-lonbarde instruments, where i had too many outputs that i wanted to mix).... anyways, happy winter holidays all! matrix mixing is great. imo it works best with level control on the inputs and using switches to add an input onto a specified output rather than a bank of pots. becomes a very usable calculator in that instance! my Hinton SwitchMix is very well designed. I use the Trimmer module before hand, and each input is automatically daisychained to the the input below it. There are also switches to invert these inputs. Have you checked out the Repeater Electronics matrices? Passive 4x4. I have two and they are great for CL gear though some amplification after the signal helps. what do you use to amp? Do you still have plan to work on this matrix mixer ?